Earbuds in. Jams on. Rest of the world out. Glide to work or class in style on larger wheels, with a wider deck with rear-fender brake to complete the coolness factor. Whether you’re heading across town or up the corporate ladder, we make sure you look good getting there. So take out your buds and open your ears – your commute just got fun again! Best Adult Kick Scooter!High tech design and color. The solid one piece handlebar and stem adds a smart and sturdy ride. This would be the ULTIMATE Adult Scooter if razor added dual suspension. Smooth Ride!Edge design! Fun smooth ride; great product. So much fun!! 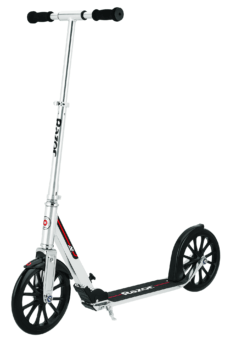 !I picked one of these up so that I could ride a scooter with my younger siblings. 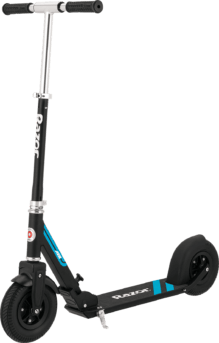 A lot of fun to ride, and a great next step up for the A scooters if you are looking for something for older kids or adults.